Over the years, home designs have evolved significantly and more emphasis has been placed on more elaborate roof systems. The trend has made the roof in many ways, the focal point of most homes. In keeping pace with this trend, design and layout computer programs have evolved are an important tool in meeting with this demand. Our team is ready and able to tackle any such challenge to ensure the integrity and results that answer to the home owner’ expectations while keeping in mind the builders needs for ease of field assembly. 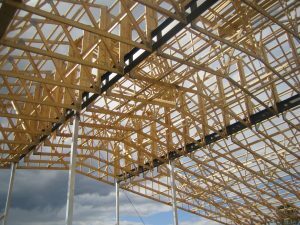 Trusses are available in many different forms and sizes. They are designed mainly to support roof loads from accumulation of snow, rain and wind and in certain cases the weight of second storey floors. All components are designed to meet or exceed local Building Codes. We take pride in our quality control program which starts from wood selection to precision cutting on computerized saws. The fabrication shop follows strict guidelines in order to produce a high quality product, which has become expected from our customers. A sample of typical truss configuration can be viewed on our link to the TPIC (Truss Plate Institute of Canada. We carry a full line of Wood I-Joist products. Each floor system sold comes with a detailed floor layout. Wood beams made from Laminated Veneer Lumber (LVL), are also kept in stock and available in a wide variety of of sizes and lengths. Our staff will provide you with the design and selection of proper sizes, to meet local Building Codes, for any project involving beams or lintels. One of our unique products, is our Open Web floor joist system. The engineering design and steel webs which are part of our floor systems, are supplied and manufactured by Mitek Canada Inc. The Posi-Strut floor system offers a great deal of advantages over regular framing lumber. Longer spans are achieved by a variety of available depths from 9 ¼’’, 11 7/8’’, 12 ¾’’, 14’’, through 16’’. Top and bottom chords are made from 4×2 K.D. lumber of different grades, giving the floor system an inherent strength and stiffness that meet or exceeds Building Code requirements. We stress the fact that the floor system is in most cases made to measure for each individual project thereby saving time during installation, since very little or no cutting is required on site. 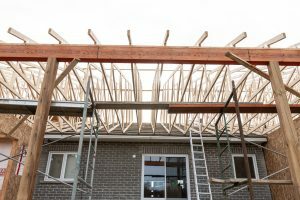 The 4×2 surface area of the joists also provides a wider surface area for the laying of the subfloor, not to mention the added bonus of a stiffer subfloor due to the shorter edge distance from joist to joist. End details on the Posi-Strut make it extremely versatile for different installation and applications. 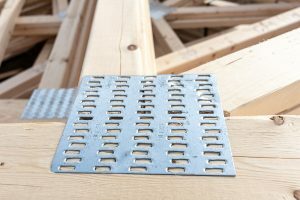 One noted feature is the top chord bearing option which allows the joist to hang from the top chord when installed on a ledger or a recessed beam. This eliminates the need to install joist hangers and therefore decreases the overall installation time. This is especially convenient with the increasing popularity of insulated concrete forms (ICF) in the use of foundations and walls. Full layout drawings are supplied for the installation of all floor systems. We are distributors of steel roofing and siding. The product comes in a variety of forms and colors. An excellent assortment of accessories is available to facilitate installation. 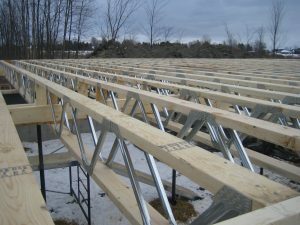 We carry a full line of structural connectors to compliment truss and floor joist installation. Our staff is on hand to help you select the proper hardware for your project.